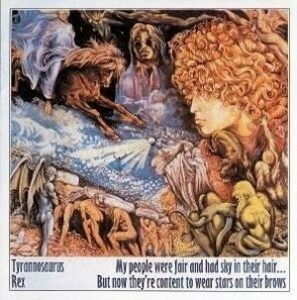 Tyrannosaurus Rex would understandably have thought they’d cracked it when their first album, the expansively-titled ‘My People Were Fair and Had Sky in Their Hair…But Now They’re Content to Wear Stars on Their Brows’ hit the UK charts. Released in July 1968, it immediately made the bestsellers at No. 22, reaching its peak two weeks later at No. 15. Then came a setback. 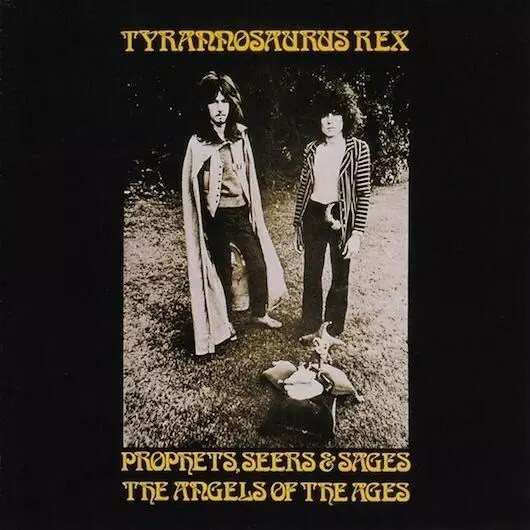 Just three months later, Marc Bolan and his partner in the group, Steve Peregrin Took, released the follow-up album ‘Prophets Seers & Sages: The Angels of the Ages’ — and it missed the charts altogether. But 43 years ago today, four years after their first release, the two albums found themselves together at No. 1. What had happened in the interim, of course, was that after two more records as Tyrannosaurus Rex (‘Unicorn’ and ‘A Beard of Stars’), the band abbreviated itself, so to speak, leading to a serious national outbreak of T. Rexstasy and Bolanmania. The ‘T.Rex’ album of summer 1971 reached No. 7, then a ‘Best Of’ set of their early work went to No. 21, before ‘Electric Warrior’ charted in October and spent Christmas and the new year at No. 1. Bolan’s new fans were now eager to snap up anything with his or his band’s name on it, and a single reissue of ‘Debora’ and ‘One Inch Rock’ was already in the top ten, at No. 7, in the week that the double album hit the charts at No. 2. A week later, the twinpack album went to No. 1, replacing Deep Purple’s ‘Machine Head.’ Bolan’s early creative outpourings had been completely embraced by his new audience. via The T. Rex No. 1 That Took Four Years – uDiscover. This entry was posted in Album, Music and tagged 1968, 1970's, 60's, 70's, Albums, Charts, David Platz, Double Album, Folk, Marc Bolan, Psychedelia, Psychedelic, Rock, Seventies, Sixties, Songs, Steve Peregrin Took, T.Rex, Tyrannosaurus Rex. Bookmark the permalink.